Boaters, welcome to October! As much as we love the summer, we are officially ready for the bats & boos that this spooky month is filled with. Hearty New Englanders know there's no better way to see the fall foliage than from the water, and boaters across the country can make the most of October as well by heading to harborside events. Find a haunted shipyard, pumpkin flotilla, apple festival, Oktoberfest, or costumed regatta near you! Still looking for those fun September events to do with your crew? Click here. Know of events happening in your area for the months of November or December? 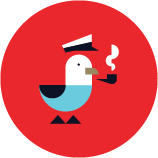 Get in touch: Tweet at us, message us on Facebook, or email amanda.jones@dockwa.com. October 6: Wine Sail. A gorgeous scenic sail, with different options of wine, on board the 74-foot Sailboat, Frances. October 7: Portland Harvest Festival. A family-fun celebration of Fall with live music, food, and activities for the entire crew. October 16: Harvest on the Harbor 2018. The Festival brings food lovers together for unique experiences that encompass Portland's culinary culture. October 21: The 4th Annual Portland Lantern Walk. This is a public art series taking place in Deering Oaks Park. NEW Rockland – October 19: Singing the Sea: A Concert of Maritime Songs. This is the final concert of the Rockland Folk Arts 2018 season. Damariscotta – October 5 - 8: Damariscotta Pumpkinfest & Regatta. This festival is in celebration of pumpkins with events taking place all throughout Columbus Day Weekend. The Pumpkinboat Regatta will take place at noon on Monday! October 21: The 1st Annual L.L.Bean Flannel 5K. October 28: The 8th Annual Burlington Halloween Bike Ride. There will be sweet prizes for the best group, the most clever, the scariest, and the best use of a bicycle. At the end, there will be delicious pizza, music, prizes, and the awards ceremony! October 28: The 4th Annual Trick-or-Treat Street. Celebrate Halloween in downtown Burlington from 1-4 PM. Kids of all ages are invited to come down to The Church Street Marketplace in costume for free trick-or-treating and Halloween activities. Barnet – October 6: The 15th Annual Rubber Ducky Derby. An annual fundraiser for Ben's Mill, an old water-powered mill that is being restored to a working museum. There will be tours of the mill, food available and a kid's table. Jay – October 14: The 8th Annual Bean & Brew Festival. Jay Peak's annual Festival features some of the finest locally-roasted coffees coupled with New England's finest beers. October 7: Wicked Haunted Waterfront Tour. Explore the darker past of Portsmouth on this haunted history tour. Seek out the shadows of shanghaied sailors and uncover the city's sordid past. October 20: Pumpkin SMASH. Pick a pumpkin from the pile, choose from an array of mallets, or two-by-fours and swing away! October 20: Crawl of Screams - Portsmouth. This Halloween, dress how you like and be whoever you want at the Crawl of Screams. October 26 - 27: Ghosts on the Banke. Come and meet the Ghosts on the Banke at Strawbery Banke's famous Halloween celebration. Long-dead sea captains, 17th-century shopkeepers, and wayward pirates haunt the streets and houses of Portsmouth's oldest neighborhood as you trick-or-treat safely from house to historic house. October 30: Historic Portsmouth Legends & Ghosts Walk. An evening walk to some of the most historic and haunted locations in downtown Portsmouth. Hear about the Phantom of the Music Hall, strange tunnels and the unusual secrets hiding underneath Portsmouth streets and basements. Each guest will receive a trick or treat goody bag with either a trick or a treat inside! October 31: Portsmouth Halloween Parade. Marching into its 24th year, the Portsmouth Halloween Parade is a grassroots, all-inclusive celebration of community, creativity, and free expression that walks, stalks, dances, and trumpets through downtown! Goffstown – October 14: The 4th Annual Goffstown Pumpkin Regatta 10K. The race begins at 8:30 AM followed with a post-race celebration at the Village Trestle and the last part of the day will consist of the Pumpkin Regatta where Giant pumpkins are turned into boats and raced down Glen Lake. NEW Milford – October 5 - 7: The 29th Annual Milford Pumpkin Festival. Signature festival events include the beer & wine tasting tent, a spectacular fireworks show, two stages of live music and entertainment all weekend, the Giant Pumpkin Weigh-in contest, bounce house, carnival rides and so much more. NEW Dover – October 6: Apple Harvest Day. A day-long family event, featuring more than 400 crafters, delicious food, live music, and entertainment, etc. The 5K road race starts at 8:30 AM on River Street. NEW Center Sandwich – October 6 - 8: The Annual Sandwich Fair. A full weekend of entertainment for the whole family. Events include Horse Pulling and Oxen competitions, exhibitions of goats, sheep, rabbits, and poultry. The exhibit halls will be full of canned goods, baked goods, flowers, and veggies. There will also be a Skillet Toss and a Keg Toss! NEW Berlin – October 13: The Annual RiverFire Festival. Burning brighter and hotter than ever with hundreds of jack-o-lantern's and bonfires illuminating the river, the spectacular annual RiverFire Festival will set the Androscoggin River ablaze at dusk! NEW Concord – October 19 - 20: Enchanted Forest. A family-friendly event for ages 4 to adults. Follow the enchanted trail into the nighttime forest illuminated by real jack-o-lanterns. Encounter larger-than-life creatures and characters as they present skits about mysterious activities in nature. New North Conway – October 19 - 28: Pumpkin Patch Express. All departures are from the North Conway Station for a leisurely round-trip train ride aboard vintage coaches to the White Mountain Cider Company where each child can visit the Pumpkin Patch and select their own pumpkin. NEW Holderness – October 27: Halloween Hoot N' Howl. 40-minute guided tours will depart every 10 minutes, bringing guests around a Halloween-themed trail. Along the way, guides will stop for guests to watch skits and other spooky attractions. October 1 - 31: Pirate Harbor Cruise. Tour Boston Harbor aboard a pirate ship! October 1 - 31: Ghosts & Gravestones Tour. A 90-minute spine-tingling walking tour of two of Boston's oldest burying grounds. October 1 - 6: Boston Fashion Week. An annual celebration of Boston style featuring a great wealth of local talent. October 3, 5, 10 & 12: Seaport Sweat 2018. Boston's free outdoor workout series. October 6 - 7: Boston Occupied: An Insolent Parade. A reenactment of the landing of British troops in Boston 250 years ago. October 7: Ben Howard will be performing at the Blue Hills Pavilion. October 7: BAA Half Marathon. Presented by the Dana-Farber Cancer Institute. October 8: Reebok Boston 10K for Women. October 13: New England Chocolate Festival. A unique opportunity to discover some of the world's best chocolate and confections. October 13, 20 & 27: B.A.R.K. in the Park. Join National Park Rangers for a half-mile walk from Carson Beach to Dorchester Heights, followed by tips, treats, and fun. October 19: The Fall Pumpkin Float. 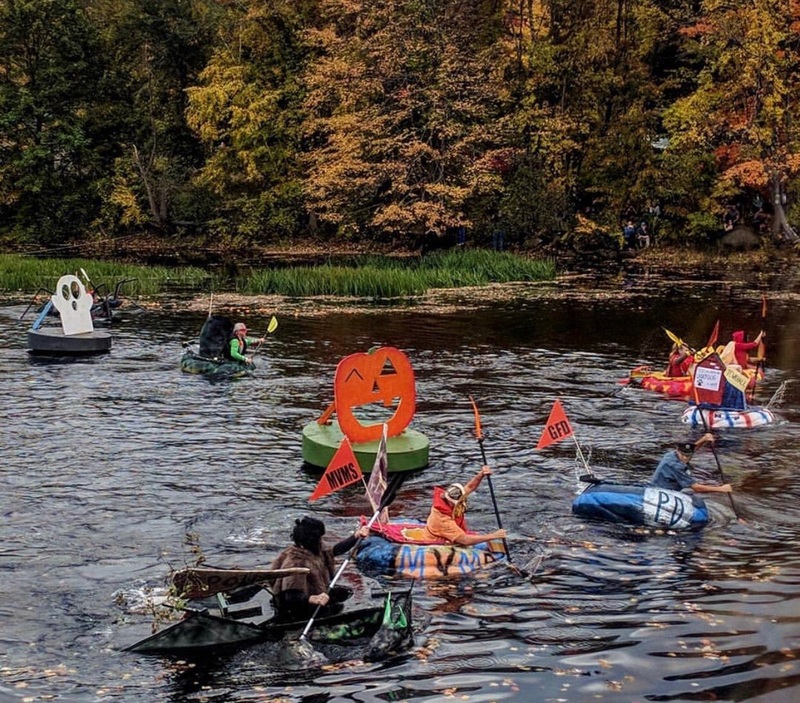 This event features floating pumpkins, kids' activities, and music at Boston Common Frog Pond. Bring a hollow pumpkin under 8 inches in diameter & watch as it floats in the pond! October 20 - 21: Head of The Charles Regatta. Since its origin in 1965, the Head Of The Charles Regatta has welcomed the world's best crew teams to the banks of the Charles River for the ultimate two-day rowing competition. October 25: The 3rd Annual Harvest Party at Boston Public Market. There will be over 30 vendor food samples, 10 New England brewery & cider pop-ups, along with live music. October 27: Haunted Hotel Halloween Party. W Boston invited scream seekers to the highly anticipated Haunted Hotel. Guests will check into this unforgettable affair and enter a dark and twisted fantasy where luxury takes a sinfully wicked turn. October 27: Halloween Pet Parade. Dress up your pet and parade around Faneuil Hall Marketplace then walk the red carpet in front of a panel of judges. October 31: The Harpoon Halloween Party 2018. Get creative and win big in the costume contest, enjoy a caramel apple bar, Halloween-themed trivia, and cool prizes. October 31: The Black Pearl Haunted Cruise. The Spirit of Boston will have four decks, three DJ's and two floors of music for you to monster mash the right way. Enjoy a three-hour sail with views of the Boston skyline too. October 7: Cambridge 5k - Oktoberfest. Join in for a German-themed 5k through Kendall Square. October 27: The 11th Annual Great Pumpkin Fest. Taste pumpkin flavored beers from across the United States and have a great time with your friends & family. Wellfleet – October 13 - 14: Wellfleet OysterFest. The Oyster Festival is an annual celebration of the town's famous oysters, clams and its deep-rooted shellfishing traditions. East Falmouth – October 13: The 7th Annual Cape Cod Brew Fest. Sample beer from over 100 brewers while enjoying live music, food trucks, and dozens of additional vendors. Princeton – October 13 - 14: The 35th Annual AppleFest at Wachusett Mountain. This is Wachusett's most popular fall festival which celebrates over 100 craft exhibitors, a farmers' market, kids entertainment, and some beautiful fall foliage. Enjoy live music, Apple Pie Baking, Eating Contests, and the Giant Pumpkin Weigh-off. October 23 - 25: The Great Pumpkin Parade. Visit the grounds of the RJD to see a display of Jack-O-Lanterns, carved with care by community members. Inside the mansion, children can participate in a scavenger hunt with prizes. Quincy – Every weekend in October: Ghost Ship Harbor. A haunted house attraction located deep in the Quincy Shipyard. There is an activation area where you can find food, entertainment, a bar, tarot card readings, midway games, Virtual Reality experiences and more. The main attractions take place on the deck of a 716-foot destroyer (battleship). October 7: The Nantucket Half Marathon. October 13: The 19th Annual Harvest Fair at the Old Mill. Enjoy an afternoon of activities celebrating the history of Nantucket harvests! Highlights of this event include tours of the Old Mill, old-fashioned games, and autumn crafts. There will also be seasonal refreshments including apple cider, apples, and cornbread. October 20: The 2nd Annual Camp Richard Family Fun Day. Join in with the Nantucket Land Council and the Nantucket Civic League for a free family fun day to celebrate the protection and preservation of Camp Richard. There will be camp games, a BBQ, face-painting, a raffle, a scavenger hunt and much more. October 21: Bartlett's Farm Fall Festival. Celebrate the season by participating in pumpkin carving contests, hay rides, great fall food, games, petting goats, beer tastings, face painting and so much more at this family-friendly event. October 1, 8 & 15: VX One Monday Night Series. Enjoy VX One Racing hosted by the IYAC. October 4 - 8: The 4th Annual Rogue Island Comedy Festival. There will be 15 stacked shows across 5 nights, featuring over 50 stand-up comics from Comedy Central, The Tonight Show, The Late Show, HBO, Netflix, SNL, and more. October 5 - 7: The 2018 New York Yacht Club Global Team Race Regatta. Teams from England, Ireland, Italy, Australia, Argentina, Germany, Japan, the Netherlands, and the United States will gather at Harbor Court for a two-on-two team race designed to showcase the international appeal and spectator-friendly nature of team racing. October 5 - 8: Bowen's Wharf Columbus Day Sidewalk Sale. Make your way to the waterfront for specials at the local shops. October 6: The 2018 Broadway Street Fair. The Street Fair will begin at Equality Park and extend all down into Washington Square. The day will be filled with music, food, family activities, exhibiting artists & makers and local non-profits. October 6: Beach Cleanup at Second Beach. Lend a hand, care for the land on Saturday from 12-2 PM. October 7: Newport Marathon and Half Marathon. This seaside course showcases the best views of Newport. October 10: Ales for Animals. Enjoy a fresh brew with your furry friend on the outdoor pavilion from 5 - 8 PM. For each beer sold, Newport Craft will donate $1 to the Potter League for Animals. October 10: Midtown Oysters Bar's 6th Annual Pig Roast. October 11: Women in Business After Hours. Join for a networking event over food and wine for the fall Women in Business event, featuring special guest speaker, Catherine Zipf. October 12: Newport Harbor Trash Skimmer Tour. Join Clean Ocean Access to learn about how the city of Newport is trying to clean up marine debris. The four Marina Trash Skimmers in Newport, have removed a combined 30,000 pounds of debris over the past two years from harbors and marinas on Aquidneck Island. October 12: The 2018 Newport Shipyard Pumpkin Regatta. Battle for the brave and help raise money to support Warrior Sailing Program and the Women's Resource Center. October 13: St. Joseph's Harvest Fair 2018. Join in for food, games, and lots of fun at St. Joseph's Parish. There will be baked goods, raffle theme baskets, a quilt raffle, a silent auction, and much more. October 13: The Trinity Church Annual Pumpkin Patch. The Patch will officially open on the 13th and offer a wide selection of mum, pumpkins, and gourds to be purchased. Be sure to pick up some props from the photo booth and take a spooky family photo! October 13: 3-Hour 12 Meter Racing Experience. 12 Meter Charters gives people the opportunity to sail and race aboard America's Cup 12 Meter yachts that raced in the America's Cup. October 13 - 14: The 28th Annual Bowen's Wharf Seafood Festival. Honoring the harvest of the sea, this Festival offers fresh local seafood, continuous live music, and tons of family fun. October 14: Fire Prevention Family Day. Look, Listen, Learn with the Newport Fire Department at Easton's Beach. There will be a Fire Extinguisher and Vehicle Extrication Demonstration, smoke trailer, rock wall, and even Pet CPR. October 17: Women's Adventure Film Tour - Newport RI. This tour is a celebration of the fantastic women around us who are doing extraordinary things. The films are to be enjoyed by women and men of all ages. October 20: Gooseberry Autumn Artisan Festival. An event for the whole family. There will be a ton of arts and craft vendors, children's events such as pumpkin painting, food, and live music. October 20: Fall Friend-Raiser at Sail Newport. An afternoon social hosted by the Newport Public Education Foundation to meet and mingle with fellow Newport Public School parents, teachers, and friends. October 21: The 8th Annual Citizens Bank Pell Bridge Run. This is a 4-mile run or walk over the famous Newport Pell Bridge. This is the only day of the year that pedestrians are able to cross this iconic bridge on foot! October 23: NewportFILM screening of Free Solo at the Casino Theatre. This is a stunning, intimate and unflinching portrait of the free soloist climber Alex Honnold, as he prepares to achieve his lifelong dream: climbing the face of the world's most famous rock...the 3,000-foot El Capitan in Yosemite National Park...without a rope. October 24: NRF'S Golden Birthday. The Newport Restoration Foundation's 50th Birthday. Celebrate the work that has been accomplished and the exciting road ahead with light refreshments. October 28: Magical Movie Night at the Newport Marriott. Celebrate Halloween by watching Hocus Pocus in the Newport Marriott Ballroom. There will be a cash bar stocked with beer and wines for the parents and a complimentary candy bar for the kids. All donations accepted for Hasbro Children's Hospital and The Confetti Foundation. October 28: Presentation on the Race to Alaska, r2AK, by Joachim Roesler at the Newport Yacht Club. Come listen to the first-hand experience of NEMA member, Joachim who participated in the 2018 r2AK. October 12, 13, 19, 20, 26 & 27: The Fortress of Nightmares at Historic Fort Adams. The Fortress of Nightmares consists of four different haunted attractions inside North America's largest coastal fortification. Tunnels of Terror is a maze of Halloween horrors built deep inside the tunnels beneath Fort Adams. Mayhem 3D is a UV enhanced dark walk through haunted maze staffed with scare-actors. Rising Spirits is a presentation of Haunts for the Homeless and Paranormal360 is a 360 degree synchronized video experience, linked with special effects and unexpected frights. October 6, 13, 20 and 27: The Saturday Farmer's Markets at Newport Vineyard. On Saturday morning from 8:30 - 12:30 PM check out the Aquidneck Growers' Market held outdoors on Newport Vineyards grounds. October 13: Pumpkin Fit Camp at the Farm. At Sweet Berry Farm from 9 - 10 AM there will be an all fitness levels, all ages, Fit Camp. If you ever wondered what it would be like to get a full body workout in using a pumpkin, now is your chance to try it out! October 20 - 21: Oktoberfest by the Beach. Enjoy local craft beer, food, and live music at Diego's Barrio Cantina. October 26: The 3rd Annual Halloween CarnEvil Celebration at Newport Vineyards. A premier costume party with an evening full of Circus Dynamics jugglers, TEN31 performers, DJ Jay Buff from 92 PRO-FM and prizes for best costume. October 27 - 28: The 3rd Annual Harvest Festival at Newport Vineyards. This is a day full of grape stomping, wine, Taproot beer tasting, and pie eating goodness. Enjoy live music, alcohol, and food. There is even a Grape Stomping Competition and a Pie Eating Contest. October 1 - November 4: Escobar's Highland Farm Corn Maze. Go get lost in the 8-acre corn maze! October 13: Beach Cleanup at Cory's Lane from 12-2 PM. October 14: The 2018 Heart & Sole Walk for the Animals. Animal lovers and their dogs are invited to enjoy a 1 or 2-mile walk and celebration of their furry friends at the Glen Park. This event is to benefit homeless animals. October 25: The 2nd Annual Hallowine at Greenvale Vineyards. Join Clean Ocean Access at Greenvale for a wine tasting, light hors-d'oeuvres, and live music. NEW Jamestown – October 7: Wheels n' Steel 2018 at Fort Getty. There will be lots of trucks, police cars, fire trucks, and military trucks for all to touch and sit in & on. Block Island – October 7: The Block Island Half Marathon. October 1: Audubon Society: Citizens Bank Free Family Fun Day. Enjoy crafts, nature stories, animal discoveries, hikes and more. October 4 - 25: Hauntings of Linden Place Guided Tours. A one-hour tour of the Lind Place Mansion. Learn about the rumored hauntings of Colt Farm and Colt Memorial School, about vampires roaming the towns of Rhode Island in the 1800s and much more. Enjoy light refreshments after. October 27: The Perfect Pumpkin Party. Head over to the Audubon Environmental Education Center and search for hidden pumpkins throughout the wildlife refuge, try your hand at pumpkin games, and then collect stickers for your own "patch." October 28: Scavenger Haunt at the Herreshoff Marine Museum. There will be pumpkin decorating, tours of the museum, face painting, food trucks and more. Don't forget to wear your costume! October 1 - 21: Pumpkin Palooza. Frerichs Farm & Greenhouses is hosting Pumpkin Palooza every weekend through October. October 6: The Southern New England Giant Pumpkin Weigh-Off. Enjoy a very family oriented day full of giant pumpkins and gourds at Freriches Farm. There will be a free corn maze, pirate ship and western town for the kids to play in along with pumpkin painting and building your own scarecrow. October 7, 14, 21 and 28: Schoolyard Market at Hope & Main. Grab your favorite treats for breakfast, lunch or dinner from the local farmers market! October 4 - November 4: Jack-o-Lantern Spectacular at The Roger Williams Park Zoo. This year's show includes more than 5,000 intricately carved pumpkins featuring scenes of wizards, fairy-tales, and the luminaries of great myths and legends, alongside superheroes, and historical figures who changed our world. Revel in the sights and sounds of the season at the spectacular. October 6: The 26th Annual International Oktoberfest. Taking place at Bold Point Park on the East Providence waterfront, this event brings together dozens of seasonal, craft, imported and local brews, autumnal libations, food trucks, and a lively backdrop of entertainment. October 6 - 8: Federal Hill Columbus Weekend Festival. The Federal Hill Commerce Association will be hosting its Annual Columbus Day Weekend Festival on historic Federal Hill in Providence. The Annual Columbus Day Parade will take place on October 7 at 11 AM. October 11: Taste of Rhode Island. An original fundraising event at Roger Williams Park Botanical Center that brings together a number of Rhode Island's top chefs and caterers to offer attendees a taste of Rhode Island. October 17 - 18: Commercial Marine Expo 2018. A trade show happening at the Rhode Island Convention Center with commercial vessel owners and operators, tug/tow owners and operators, fishing vessel owners and operators, harbormasters, boatyard operators, etc. October 19: The Malted Barley Oktoberfest. Head down to celebrate October by enjoying German beers and participating in a Stein Hoisting competition. October 27: Halloween at the Castle. Celebrate Halloween at Barnaby Castle with an open bar, food, entertainment, a costume contest and more! The event raises funds to support Barnaby Castles restoration. South Kingston – October 11: Food Truck Night at Sons of Liberty. Children and families are welcomed and encouraged to attend and enjoy the food trucks and outside activities. NEW Tiverton – October 5: Jack O' Lanterns in the Garden. An evening stroll through the Sandywoods Community Garden trail. The garden will be decorated with Jack-O'-lanterns, autumn, and Halloween themes. The pumpkins will be illuminated from 6-8 PM. October 2: Where Land Meets the Sea: Hurricane Sandy and Its Impact on Rhode Island's Coastal Archaeological Record. Hurricanes and Nor'easters have routinely battered Rhode Island's south coast, impacting the lives of residents and leaving millions of dollars in property damage. This event showcases the results of archaeological sites damaged by Hurricane Sandy in 2012. October 13: West Marine presents a Shrink Wrap Demonstration Event. Join West Marine for a professional demo of proper shrink wrap techniques, materials, and equipment. October 28: The 2018 Ocean State Rhode Races. The race weekend features a Marathon, Half Marathon, and a 5K Race. This Rhode Island Marathon will showcase what is great about the Ocean State. October 6 - 8: Chowder Days. What better way to enjoy the cool fall days than with a hot bowl of chowder at the Mystic Seaport Museum! Head on over and try a variety of chowders and other fall food favorites during Columbus Day Weekend. October 12, 13, 19, 20, 26, 27 & 28: Nautical Nightmares: Madness on the Mystic River. Join for an evening of haunted thrills with Nautical Nightmares. In this frightening theatrical, Mystic is falling into chaos. You will join the alienists of Arkham to investigate a haunted whaleship and the madness that has descended through the town. October 12: Mystic Pirate Invasion. Join with your fellow pirate lovers in Downtown Mystic for a weekend of pirate-themed fun. October 13: Oktoberfest 2018 Party at The Engine Room. Have a taste of German food and drink specials along with a Stein holding contest, live band, and did we mention German beers? October 18 - 21: The Mystic Film Festival. Enjoy the films at the first annual Mystic Film Festival. October 27: Sea Scare. This Halloween, see the dinosaurs get in the spirit with a special trick-or-treat trek through the Dino trail at the Mystic Aquarium. NEW Fairfield – October 5 - 7: The 2018 Roger Punzi Memorial Regatta put on by the Candlewood Yacht Club. NEW New London – October 27: The 10th Annual Harvest Festival. A free family-friendly event with horse-drawn wagon rides, activities for children, face painting, musical entertainment, kettle corn, apple cider, and so much more. Centerport – October 6: The 38th Annual William K. Vanderbilt II Memorial Cup Race presented by Centerport Yacht Club and the Vanderbilt Museum. NEW Oyster Bay – October 13 - 14: The 35th Annual Oyster Festival. This is the East Coast's largest waterfront festival with more than 60,000 oysters. The Festival will include live entertainment, ships, top-notch artisans, pirate shows, midway rides, the iconic oyster eating and shucking contest, and an amazing food court where volunteer chefs and culinary pros work side by side. NEW Mohawk – October 13: Dark in the Park. A free outdoor movie night put on by the Mohawk Library Auxiliary. The movie will be "Hocus Pocus"
NEW Montauk – October 20: 18ESA NY6 Montauk Surf Classic. This is a full day event that will take place at Ditch Plains Beach. It will include a family style dinner and awards ceremony after the day of surfing. NEW Geneva – October 26: Outdoor Movie Series. Enjoy a showing of Coco beginning at sunset. NEW Greenport – October 1 - 28: Never Too Late to Sail. Private three-hour lessons for sailors of all levels of experience on a 27ft racing sloop. Book at the Front Desk of Sound View Greenport. October 6, 7, 8, 13, 14, 20, 21, 27 & 28: Boo at the Zoo. Enjoy a Halloween themed visit to the Bronx Zoo. There will be a costume parade, magic show, a hay maze, a haunted forest, pumpkin carvers, and treats! October 6, 13, 20 & 27: Free Kayaking at Pier 26. October 7: History of Central Park Tour. October 13 - 14: The New York Coffee Festival. Enjoy flavors from dozens of local and international roasters, tastings and interactive workshops, latte art demonstrations from world-class baristas, delicious street food, and coffee-based cocktails, plus live music and art. October 14: Pumpkin Painting 2018. A master artist will walk attendees through the steps to create a creative and unique Halloween decoration. All supplies, including pumpkins, will be provided. October 21: Scavenger Hunt at the Museum of Natural History. Discover all that the American Museum of Natural History has to offer while socializing and exploring its many halls. October 26 & 27: Spooky Pumpkin Nights at The New York Botanical Garden. Dress in your favorite costume, grab a flashlight, and head into the Spooky Pumpkin Garden for a nighttime adventure. Explore scarecrow and pumpkin displays and take part in more than a dozen frightfully fun activities. October 27: Bryant Park Winter Village Opening Day. The Winter Village will officially open at noon. The 17,000 square foot rink will feature free ice skating, in addition to high-quality rental skates, skating shows, special events, and other family-fun activities. The European-inspired holiday market features food and many boutiques. October 28: Halloween in Central Park. Bring a carved pumpkin to be involved in the Halloween Pumpkin Flotilla. Enjoy spooky stories, crafts, a costume parade, and much more. October 6: Water Lantern Festival at Liberty State Park. An amazing experience where visitors will witness the magic of lanterns as they light up the water. October 13: Jersey City Wine Fest. Enjoy endless rivers of internationally acclaimed wines, live music, delicious food, interactive games and more. NEW Mantoloking – October 6: The 7th Annual Beach to Bay 5K. This is a dog-friendly event, however, they must be leashed! October 12: The 2nd Annual Witches Ball. A Halloween dance with a special appearance by a local DJ. There will be door prizes, trivia and games, a tarot card reader available, and prizes for the best costume. October 19: Liberty Lake Halloween Fun-Fest & Movie. There will be an outdoor movie, Hotel Transylvania 3, along with spooky hay rides, spooky slime, and haunted carnival games. October 20: The Bordentown RiverFest 2018. A family-friendly event with a four-acre beer garden with 9 beers on tap, wine and sangria, 15 restaurants, live bands all day, teen and adult attractions, magicians and face painters. October 5, 12, 19 & 26: Open Pickleball games. October 7: The 2018 Columbus Day Parade. October 7: Pier Fest 2018. A family-friendly event including kids activities such as face painting, inflatables, fun bus, photo booth, exhibitors, vendors and crafters, live music, and great food. October 7: The 5th Annual Valerie Fund 5k Run & Walk. October 7: The Clean Ocean Action Open Surf Contest. This competition will be comprised of eight divisions that will accommodate all ages and skill levels, from the tiniest to the most experienced professional surfers. October 13: Movie Night at Pier Village. Celebrate Halloween with a Meet & Greet with the Sanderson Sisters and a showing of Hocus Pocus at the outdoor Cinema on Festival Plaza. October 20: Long Branch Light The Night Walk. Bring light to the darkness of cancer through research and cures. Light The Night is a series of fundraising campaigns benefiting The Leukemia & Lymphoma Society's funding research to find blood cancer cures. October 27: The Long Branch Fall Festival and Pooch Parade. The Fall Festival will feature arts & crafts, touch a truck, bouncy rides, a costumed pooch parade, a kids costume parade, and craft vendors! There will also be a live DJ and trick-or-treating. October 21: Red Bank Food & Wine Walk. This event includes three hours of top tastings from many of Red Bank's popular dining spots. October 4 - 8: The 2018 Annapolis Sailboat Show. This is an internationally acclaimed sailboat show, recognized as the world's largest and most prestigious sailboat show. October 11- 14: The 2018 United State Powerboat Show. Boaters from around the country gather in the historic seaport of Annapolis to shop all major powerboat manufactures, climb aboard hundreds of boats from 8 to 80 feet in length, and check out the latest in marine electronics, safety equipment, nautical wares, and more. October 21: Dogtoberfest Homebrewing Fall Festival. Spend the day with your pup sampling local home & craft-brewed beers, listening to live music, enjoying tasty food all while supporting a great cause - Chesapeake K-9 Fund. October 25: Halloween Fun Run hosted by Fleet Feet Annapolis. Join for a family-friendly monster mile or a spooky 3-mile fun run throughout the Annapolis area. Along the course, there will be pumpkins at secret locations. If you bring one of the pumpkins back to the finish line you will win a prize! October 27: The 4th Annual Howl-O-Ween Parade at Susan Campbell Park. October 28: The 17th Annual Howl-O-Ween Barkin' Bash. Bring your dog and join the fun at Quiet Waters Park. Enter your pup into a costume contest or test their training in the skills contest. Enjoy demonstrations, games, raffle drawings, and a variety of dog-friendly exhibitors. October 27 - 28: The Halloween Howl Regatta presented by the Annapolis Yacht Club. October 6: Island WineFest at Fager's Island. Enjoy a fall themed wine festival with specialty selected ciders and sour beers, craft beers, hoop tea, oysters on the half shell, and a souvenir tasting glass. October 21: Morning Beach Yoga. Meet on the beach at 118 Street with a water bottle and a yoga mat. October 27: Bikes & Boos On The Boards. Ghoul around for a costume crawl on the boardwalk starting at the Ocean City Inlet Parking lot. October 3 - 9: MD Fleet Week and Air Show. Catch the wind and join Historic Ships in Baltimore. See and tour U.S., Canadian, and British Naval Vessels or watch jets including the US Air Force THUNDERBIRDS. October 10: The 2018 Parade of Sail. A spectacular parade of schooners sailing around the Inner Harbor. October 13: The 52nd Fell's Point Fun Festival. A neighborhood street festival with live music, street vendors, and fun activities for the whole family. October 20: OktoBEARfest. Enjoy sampling over 50 fall-flavored beers, listening to live music, and eating great food at The Maryland Zoo. October 28: Trick or Treat at the Square. Belvedere Square's 7th annual trick or treating in the square is a fun-filled Halloween celebration for the whole family. October 6 - 7: Power Fleet Cruise. An Oktoberfest Cruise along the South River. October 13 - 14: Sail Fleet Cruise. A sailing cruise around Eagle Cove. October 27 - 28: Sail & Power Cruise. The MYC Frostbite Cruise. October 5 - 8: Paddling Escape to a Virginia Island Lodge. Spend Columbus Day Weekend exploring Virginia's wild seaside islands by day, staying in an island lodge at night. October 20: Benefit for the Waterman. Being a waterman is a tough job. It is important to be mindful of the hardship of the harvest that goes along with the delicious seafood that everyone enjoys. Enjoy oysters, seafood, and fall harvest while talking with watermen. October 27: The 4th Annual Trick or Treat on the Creek. Hosted by The Oyster Farm Marina from 5-8 PM. Enjoy pumpkin painting, trick or treating and a best-decorated boat contest! October 1 - 31: Hunt Club Farm Harvest Fair. Celebrate the fall season every day in every way with bushels of activities at the Hunt Club. There will be farm-tour hayrides, the largest pumpkin patch in Virginia Beach, inflatable amusements, carnival rides, food, novelty vendors, and a DJ. October 13: Fall Fest. There will be lots of activities for all ages at this festival including pumpkins, cider, crafts, photo booths, and other fall goodies. October 20: Harvest Fair. Enjoy a craft show, food trucks, carnival, pumpkin decorating contest, Dallas band, children's activities, and lots of pumpkins. October 20: The 6th Annual 757 Battle of the Beers. The only festival in Hampton Roads that exclusively features local 757 Craft Breweries as they battle it out to win in different beer categories. October 27: New Realm VA Oktoberfest. Live German music, German food trucks, German beers, and lawn games. October 13 - 14: The 56th Annual Ocean View Art Show. The Chesapeake Bay Art Association is celebrating its 56th year of hosting the Ocean View (OV) Art Show at the Ocean Beach Park. Enjoy the friendly, relaxed nature of the show along the Chesapeake Bay. October 20: Fleet Fest. The Naval Station Norfolk Fleet Fest is free and open to the public as a family-friendly event. There will be live entertainment, ship tours, static aircraft displays, large children's playing area, military demonstrations, and a chili cook-off. October 20: Commonwealth Coastal Classic. The Classic will host a delicious variety of chefs' tables, Virginia wines, spirits, crafted beers and ciders for tastings, original artisan works for sale, chef demos, live music and much more. October 20 - 21: The 31st Annual Town Point Virginia Wine Festival. Explore all the fine wines the Commonwealth has to offer all available right on the downtown Norfolk waterfront. October 27: Wicked Waterside 2018. Grab your crew of goblins and ghouls, and zombie-walk your way to Downtown Norfolk for the Halloween event you don't want to miss. Enjoy a night of live entertainment, plenty of tricks and treats, a costume contest and more. Bath – October 19 - 20: Check out the Tricentennial of the notorious Blackbeard. The Town of Bath and the Greater Bath Foundation proudly observe the Tricentennial of Blackbeard, his crew, and their families who bravely established North Carolina's oldest town, the state's first port, its oldest standing brick church, and the foundations of our nation. NEW Corolla – October 3: OBX Yoga Retreat. Enjoy stunning Ocean views while saluting the sun. This is a 5-day and 4-night Yoga retreat right on the beach. October 6: The 3rd Annual Oktoberfest Under the Bridge at Waterline Brewing Company. Dress in your finest lederhosen for this fun event. There will be huge beer tents, live bands, food trucks, face painters, coolest Stein contest, Best Dressed contest and more. October 13: The 2018 Ironman 70.3. A popular race with a fast and flat course that takes in US Naval History and the coastal beauty of southeastern North Carolina. October 20: Oysterberfest 2018. An oyster roast and German cuisine accompany the lineup of fall beers. There will be a beer garden and live music performances. October 28: The 2nd Annual Howl-O-Ween Doggie Costume Party at The Sour Barn. There will be games, doggie talent show and prizes for the best costumes. October 6 - 7: Oktoberfest 2018 at The Salty Turtle Beer Company. October 13: Fire Safety Day hosted by the Town of Surf City Fire Department. This is an all ages free family-friendly event to come learn about fire safety while enjoying seeing firetrucks from different departments. October 27: Surf City Fall Fest. Enjoy food vendors, inflatables, games, costume contest, performances, and a showing of Hocus Pocus at sundown. October 6: Oktoberfest. Mark your calendar for a day filled with beer and lederhosen. October 13: Pumpkin Fest at Silvermont. A family-friendly event with beautiful lighted pumpkin trails, music, food, games, storytelling, face painting, white squirrel scavenger hunt, tour historic mansion, and food. October 27: HalloweenFest. A fall festival filled with great fun, lots of interesting costumes, vendors, and a big celebration. October 5 - 7: The 2018 Myrtle Beach Seafood Festival. A destination event that will celebrate the multitude of local seafood restaurants and eateries along the Grand Stand. October 7: Fall Kite Festival. Experience a kite festival including a big, little, micro, dual line, and even a quad line kite. October 12 - 13: The 10th Annual Myrtle Beach Oktoberfest. Enjoy live entertainment and lots of beer. October 27: Ghosts on the Coast - Halloween Celebration. Enjoy a Halloween on the water. Crawl into your scariest costume and enjoy live music, delicious local food, street performers, carnival games and much more. October 27: Myrtle Beach Truck-or-Treat. A free community event that is a hands-on, interactive experience for kids and their families to look, see, touch and ask questions. From emergency vehicles to trash trucks, big rigs and more, kids are encouraged to explore all the vehicles on display and trick-or-treat with the vendors. October 27: Hippie Fest. A grassroots festival where free-spirited people from across the country gather to celebrate peace, love, and hippie-ness. This event will feature live music, bohemian shopping, vintage hippie car show, DIY tie-dye, giant bubble garden and more. October 21: Mindful Triathlon at Coligny Beach. A fun 5K your way; run or walk, prance or skip, stroll or strut to the finish line of this 5K. Following the 5K there will be a 45 minute Yoga session on the beach. October 26: Ghosts and Myths of Hilton Head Island 2018. Experience the chills of the paranormal stories of Hilton Head Island. October 16: Movie on the Lawn. Bring your blankets and chairs for this family-friendly movie night watching The Nightmare Before Christmas. There will be popcorn, food, drinks and adult beverages available for purchase on the lawn. October 20: The Annual YMCA Fall Festival. Enjoy fun for the whole family with a family haunted house, carnival games, a bounce house, trick or treating, a costume contest and much more. October 20: Fall for Naples. Ring in the fall season at this family-fun event! This event will feature an inflatable corn maze, live music, dunk tank, fun slide, obstacle course, etc. October 26 - 28: Naples Stone Crab Festival. The Festival will offer plenty of fresh stone crab claws, music, events, art and a ton of other fun activities for the whole family. October 27: Naples Monster Dash 5K. October 30: Trick-or-Treat & Halloween Extravaganza. There will be over 20 walkable candy stops throughout Mercato. October 31: Halloween Spooktacular. Head on down to 5th Avenue South for food, games, face painting, and more. October 4 - 7: Florida Keys Wreck Trip. The Florida Keys are world renowned for beautiful reef structures and abundant marine life. On this trip, the drive will concentrate on the incredible wrecks of the Keys. October 20: The 5th Annual Witches' Ride + Dance. The Key Largo Witches have three dances and will be spaced between raffles and other ghoulish events. October 31: Halloween Night Dive. Join Key Largo Dive Center on Halloween and explore the Benwood Wreck. October 10: Pirate Sunset Cruise. Party like pirates aboard the Jolly II Rover for a sunset cruise. Dress like a pirate while eating snacks and drinking beer or wine. October 12 - 14: 2018 SUP Invitational. This is an inclusive paddle event for Special Olympics athletes and Stand Up Paddlers nationwide. Bring your family and friends and enjoy the day paddling. October 14: Kids Pumpkin Paint & Decorate Party. The Club at Key West Harbour is hosting this family-friendly event from 4:30-6:30 PM. There will be happy hour food and drinks for the parents while the kids paint and decorate their pumpkins. October 21: Zombie Bike Ride 2018. Rise from the dead and join your newly awakened zombies as they gather at Zombieland in Fort East Martello to get their blood flowing, bodies painted, and mid-afternoon snack from 2-6 PM! October 6: The 16th Annual Pumpkin Patch. Pick a pumpkin in order to support the homeless pets of Tampa Bay. October 12 - 14: The 9th Annual Oktoberfest - Tampa. Eat all the brats, play in the Outrageous Bavarian Games, win cool swag and prizes, and drink! October 20: The 8th Annual Tampa Pig Jig on the River. Hosted in downtown Tampa's beautiful Curtis Hixon Waterfront Park, this event will feature live music, great food, a BBQ competition, drinks, and games. October 27: The 3rd Annual Tampa Riverwalk Trick or Treat. A free community event where children in costumes and their families are invited to come Trick or Treat on the Riverwalk as well as enjoy fun activities. October 6: Artificial Reef Fundraiser. An opportunity for fellow avid divers in the community to get together and help provide new artificial reefs for people to dive. October 19 - 31: Spookyville in Yesteryear Village. A safe place to trick-or-treat for children 12 and under. October 27: Moonfest 2018. A terrifying haunted house will be available for entry for those who dare that will test your nerves and survival skills, scare areas, haunted food, and other spooky activities. October 28: The Fall Festival Regatta presented by the Palm Beach Sailing Club. October 30: Annual Halloween Puppy Paddle. Every year four-legged residents of Palm Beach County and their hoomans compete for the best-dressed pair and every year the contest gets bigger and better. Clearwater – October 18 - 21: The 39th Annual Clearwater Jazz Holiday. This is a four-day and four-night, world-class, live, music festival that takes place every third week of every October. NEW Sarasota – October 12 - 19: The 2018 F18 World Championships. October 4: The 12th Annual Wine Fest. The night will be filled with wine tasting, great food, and live music. October 12: The Haunted Bookshop. Celebrate the return of The Haunted Book Shop in downtown Mobile during the LoDa artwalk. October 19: Night at the Museum. Go on a historical scavenger hunt and talk to historical characters from all over the world, listen to a Mobile Public Library storyteller read spooky stories, and see the Mystery of the Mayan Medallion Exhibition. October 20: Holiday Market at the Corner. October 28: GulfQuest Halloween Fest. There will be a wide range of family-friendly activities for all ages, including pumpkin painting and trick-or-treating throughout the exhibits. October 11 - 14: The 47th Annual National Shrimp Festival. October 27: Gulf State Park Beach Camp Out. Camp out at Gulf State Park Pier. October 27: Kids Halloween Bash. Enjoy lots of spooky & fun indoor and outdoor activities. October 3 - 7: The 2018 Sunfish Youth World Championship. October 7 - 13: The 2018 Sunfish World Championship at the Carolina Yacht Club. October 5: Rocktober First Friday. Check out the galleries, shops, and eateries for treats and special deals. Free to the public. October 13: Downtown Biloxi Zombie Run and Crawl. Run from Zombies through Downtown Biloxi, stopping at Survivor Zones to throw back a beer or have a drink with the zombies that are chasing you! October 28: Trunk or Treat. Make plans to join in for an evening of fun, lots of candy, and enjoying the community you live in. October 3 - 7: The 2018 R19 National Championship at Southern Yacht Club. October 5: Scales & Ales 2018. Dive into Scales & Ales with beer, wine from open bars, and delicious cuisine from local restaurants. Live entertainment and a unique aquatic atmosphere are highlights of the event as it flows throughout the Aquarium and onto the plaza overlooking the Mississippi River. Your support of Scales & Ales assists the Aquarium's effort to fight plastic pollution. October 5, 6, 12, 13, 19 & 20: Oktoberfest on the Bayou. Enjoy German food, music, beer, culture, and fun. October 6: Oktoberfest at Port Orleans. Drink German-inspired beers, eat some great food and compete in games where you can win some Port Orleans cash. October 7, 14 & 21: Music Under the Oaks. Bring your lawn chairs and join for a special concert series to celebrate the Audubon Park Conservancy. October 19: Half Way to St. Partick's Day March. October 20: The 2018 New Orleans Zombie Run. A 2-mile run/walk/crawl in New Orleans. October 20: Dachshund Races at Oktoberfest. October 26: The 2018 Voodoo Music + Arts Experience. October 5: Downtown Food Crawl. There will be 13 different locations for special drinks, appetizers, entrees, and desserts. Make it a progressive dinner night! October 23: Pumpkin Shine on Line. Stroll through the park for the annual Shreveport tradition. Families and friends will enjoy the great variety of pumpkins carved by schools, families, local businesses, and other pumpkin artists. October 27: 2018 Heroes Run. Enjoy an epic route throughout downtown Shreveport, premium runner swag, and a rockin' after-party. October 27: The 7th Annual Aseana Fall Festival. This festival features the Diwali Festival of Lights and Asian street food. October 5: Movies at Lake Park. Enjoy a free, family-friendly event taking place at Mueller's outdoor amphitheater. This showing is of The Little Mermaid. October 5 - 14: Austin City Limits Music Festival. An impressive lineup of 100+ bands on 8 stages over two weekends. October 13: Brewtoberfest 2018. Celebrate all that is Oktoberfest at The Brewtorium's 1st Annual Brewtoberfest. October 27: The 5th Annual 0.5K Micro Marathon. October 27: Zombie Charge Austin 2018. A 5K mud run which includes obstacles and zombies! NEW Port Arthur – October 5 - 7: Mistletoe Market. A shopping venue for the holidays. October 5 - 21: King's Oktoberfest. There will be food, live music, jousting, a strong man competition, a ceremonial keg tapping, and an Oktoberfest photo booth. October 7: Fall Craft Vendor Show. October 26: YMCA Fall Festival. Activities will include games, haunted house, music, costume parade, food vendors, face painting and much more. October 31: The 16th Annual Trick or Treat Trail. Trick-or-Treaters of all ages are invited out to this free community-wide event. October 4: Market Days in October. Shop for produce, jams, honey, soaps, and other fall items from local vendors. October 12 - 14: Conroe Cajun Catfish Festival. Eat lots of catfish and cajun food dishes. There will be a carnival, three stages of live music, a pageant, car show, and kids zone. October 20: Pumpkin Patch. Visit the hills of Westlake community and pick out your own pumpkins. Drinks and snacks will be available. October 27: The 4th Annual Trunk or Treat. Enjoy a safe place to trunk or treat with your family. October 13 - 14: Gulf Coast International Dragon Boat Regatta. Come to see the dragons fly on the water. There will be dragon boat races all day, along with entertainment, food trucks, and vendors. October 28: Halloween Town. All little ghosts and furry goblins are welcomed to Sugar Land's annual Halloween town. The festivities include a costume contest, festive crafts and coloring stations, a spooktacular scavenger hunt, and photo stations. NEW Seabrook – October 25 - 28: The Harvest Moon Regatta. Watch yachts sail to Port Aransas under an October full moon. October 5- 28: Galveston Graveyard Tour. Take a historic walking tour of Galveston's oldest cemeteries. October 20: 1877 Tall Ship Elissa Birthday Party. Help celebrate the October birthday of The Official Tall Ship of Texas, the 1877 Elissa who is celebrating her 141st year. October 25: The Harvest Moon Regatta 2018. Enjoy the sun while the sailboats glide across the water. October 25: The Haunted History of Galveston. Join the Rosenberg Library and take a journey through the haunted history of Galveston. See photos from Galveston's epic past, and listen to audio from 1900 storm survivors. October 26: The 2018 Galveston Oktoberfest. October 26 - 27: The 35th Annual Island Oktoberfest. Enjoy authentic German food, live music, beer, games and more. October 26, 27 & 31: Scarewolf Park - Haunted Submarine. A haunted submarine tour, trick-or-treating and scary good fishing at Seawolf Park this Halloween season. October 27: The 8th Annual Mini Monster Bash. A Halloween festival that is free to the public. This festival includes trick or treating stops at local businesses throughout Downtown. There will also be games, arts and crafts, face painting, balloon artists, and costume contests. October 27: Galveston Island Historic Pleasure Pier Halloween Party. Don't forget to wear your costumes for some fun trick-or-treating and a costume contest. October 6: Barktoberfest Dallas. Celebrate a yearly tradition with a fall photo booth, pumpkin margaritas, and a vendor market. October 13: The 8th Annual Trinity River Kite Festival. An all-day, family-friendly celebration of kite flying, crafts, and marketplace activities. October 20: Deep Ellum Outdoor Market - Halloween Edition. October 20: Water Lantern Festival. The Festival is a family-friendly event that includes food trucks, live music, designing your own lantern and then launching the lantern. October 1 - November 12: Autumn at the Arboretum. A fall festival with a spectacular show of color with 4,500 of fall's favorite flowers- Chrysanthemums, along with 150,000 more stunning, fall blooming plants! Huntington Beach – October 20 - 21: BeachFront Cinema. Enjoy popular films on the Huntington State Beach. Newport Beach – October 5 - 7: Newport Beach Wine and Food Festival. Try tastes from 15 different gourmet restaurants each day and sip 200 different types of wines from 60 wineries while enjoying live music. Long Beach – October 4 - November 2: Dark Harbor. This haunted ship consists of 7 different haunted mazes, monsters, a 4D theater, immersive attractions, entertainment onstage, themed bars, and a concession food stand aboard the Queen Mary. October 3 & 7: Twilight on the Pier. Free concerts taking place on the Santa Monica Pier. There will be great music performances plus food, a beer and spirits garden, games, and other activities. October 6: Off the Hook Seafood Festival. The festival will include seafood tastings from local restaurants, curated cocktails, live music, chef demos, games, and a beer garden. Hollywood – October 4 - 7: Shriekfest. This is an international horror and science-fiction film festival competition taking place at Raleigh Studios. October 1 - 28: San Francisco Bay Cruise Adventure. Enjoy a one-hour scenic ride from Pier 39, under the Golden Gate Bridge, and then around Alcatraz. October 1 - 8: Fleet Week. Taking place over three consecutive days in the skies above the City's waterfront. An air show event that attracts over a million people around the bay. October 20: San Francisco's Wharf Fest. Featuring live music, street performers, craft and food vendors, a chowder contests, kids' rides, ship tours, and fireworks. Oakland – October 18 - 20: Autumn Lights Festival. This festival features illuminated art, fire dancers, art installations, live music, and interactive arts. Calabasas – October 20 - 21: Calabasas Pumpkin Festival. Enjoy live bands, a DJ dance zone, vendors, pumpkin food and beer, pumpkin painting, professional pumpkin carvers, kids' games, and inflatables. Santa Rosa – October 20: Floating Pumpkin Patch. Hunt for your perfect pumpkin in the pool and then deck it out at the decorating station with all sorts of fun crafts. October 6: Carving Pumpkins & Making Other Fall Crafts. A great event for kids and kids at heart to carve pumpkins and make small fall crafts. October 12 - 14: Yacht Fest. Celebrate boating at the Northern California Yacht Fest! October 13: Sunset Kayaking Tour. Paddle under a setting sun exploring the Oakland Estuary and enjoying the sea breeze. October 20: Paddle Splash at the Encinal Yacht Club. Enjoy a fun festival on the water and splash around on a demo paddleboard. Los Angeles – October 6: Los Angeles County Dragon Boat Festival on Legg Lake. Watch dragon boat races, shop food vendors and see stage shows such as Chinese acrobats, live music, and dance performances. October 5 - 6: The Great Pumpkin Beer Festival. Enjoy 80 pumpkin beers, a marching band, a DJ and food trucks. October 5 - November 3: Haunted House at Georgetown Morgue. The Georgetown Morgue is a facility for tragic stories of death. The morgue has a history of thousands of funeral preparations and cremations. October 21 - November 8: Seattle Restaurant Week. Get a special deal on a three-course meal at 165 participated restaurants. NEW Kenmore – October 4: Community Pint Night: Whale Scout. Join Cairn Brewing for a Community Pint Night to benefit Whale Scout and their work to protect the whale population in the PNW. NEW Westport – October 6 - 7: Westport Family Beach Weekend. Have a fun weekend on the beach along with taking part in the Salmon Derby and a 5K run. October 6: Point Defiance Marina Fall Swap Meet. Pick up some gently used sporting and boating equipment or clean out lockers or garages of tackle and gear others might be interested in buying. October 13: Green Tacoma Day. Tacoma's parks and open spaces provide people with clean air, water, and access to nature. Help volunteer to keep them healthy. October 18 - 21: The 36th Annual Holiday Food & Gift Festival. See, hear, and feel the coming of the holidays with over 550 exhibits in two buildings. Cleveland – October 20: North Coast Harbor 15K, 10K, and 5K run. Proceeds of the race will benefit the Hunger Network of Greater Cleveland. October 5, 6, 12 & 13: Clambake at Jackalope Lakeside. Join for a bake on the lake! October 27: Trunk or Treat 2018. Dress in costume and join for a fun and safe afternoon of trick or treating, face painting, and games for kids. October 6 - 7: Oktoberfest Regatta and the Music City Catalina Cup put on by the Percy Priest Yacht Club. October 20: Nashville Water Lantern Festival. There will be food trucks, live music, and great family fun. Start designing your lantern around 8 PM with the lantern launch around 8:30 PM. October 1: Light Up the Lakefront 2018. Chicago is launching Domestic Violence Awareness Month with their own Light Up the Lakefront event. Thousands of candles will be lit in a tribute to the nearly 12 million adults and 19 million children affected by domestic violence. October 4 - November 3: Adult Halloween Pumpkin Patch. Come for the corn maze but stay for the wicked spiked cider. October 6: The Official Chicago Wine Festival: Fall Edition. Join for an elevated wine tasting experience that aims to stimulate all senses. October 6: The 95th Street Fall Fest. Enjoy live music, a petting zoo, a variety of kid's activities, and college football games on. October 6 & 13: Oktoberfest on the Beach. Taste a variety of beers while hanging out at Shore Club on North Avenue Beach. October 6 - 7: The 31st Annual Apple Fest. Dozens of vendors participate in Apple Fest every year, selling everything from candy apples to scarves and hats. October 7: The Chicago Marathon. October 19 - 21: US Match Racing Championship hosted by The Chicago Yacht Club. October 21: Chinese Lantern Festival. Head over to the Boerner Botanical Gardens for the Chinese Lantern Festival with dragons, glowing pagodas, and iridescent pinwheels. October 24 - 28: Night of 1,000 Jack-o'-Lanterns. More than 1,000 hand-carved pumpkins, some as large as 150 pounds, will light up the night at the Chicago Botanic Garden. The LED-lit jack-o'-lanterns will be staged along a festive, paved pathway, starting at the Esplanade. October 26: Friday Night Halloween Cruise. Tickets include a live DJ, Dancing, Giveaways and the best views of Chicago aboard the three-story luxury yacht. October 6: Detroit Folk Festival. This festival will be held outside and feature several of Detroit's best folk artists, singers, and songwriters. October 13: Detroit Boat Club Beer Fest 2018. Sample 60+ craft beers and enjoy a fall day on the Detroit River at one of Detroit's oldest and most historic buildings. October 26 - 27: Detroit Fall Beer Festival. Head over to Michigan's Brewers Guild and enjoy 800+ craft beers and nearly 120 Michigan breweries, incredible food, and live music. October 27: Halloween Family Fun Day. Programming for this event includes a spider web obstacle course, mask making, Halloween Bingo, monster bowling, pumpkin bean bag toss, trick or treating, costume parade, cider & donuts, cookie decorating station, pumpkin decorating and so much more. October 4 & 21: Scuba Diving. Scuba Dive into local shipwrecks at many different dive sites. around Port Washington. October 26 - 28: The 9th Annual Port Washington Ghost Walk & 2nd Annual Ghost Hunt. October 5 - 7: The 9th Annual Milwaukee Oktoberfest. There will be live polka music all day along with a bags tournament, wiener dog racing, the Miss Oktoberfest Competition, brat eating contest, stein hoisting competition, and so much more. October 13: The 2nd Annual Fall Market 2018. Enjoy a wonderful variety of vendors and crafters celebrating the fall. October 14: Lakefront Brewery Fall Fest of Ale. There will be several food trucks and booths serving up their breakfast bests. Kids can enjoy face painting, fall photo ops, pumpkins, and caramel apples. October 22: Oysterfest. One week of the year where Harbor House shines the spotlight on the gems of the sea. There will be up to 15 different varieties of oysters and oyster dish specials. October 6: Candlelight hike in the Park. A popular night hike that starts and ends at the indoor shelter. There will be water, apple cider, cookies, and snacks. October 19 - 27: Happily Haunted Gardens. The Gardens will be filled with thousands of twinkly lights, live book characters, entertainment, and autumn delights. October 12 - 14: Boo Beach Fall Weekend. A family-fun weekend filled with rides, special treats, and a movie. October 13 & 20: The Great Pumpkin Train. A fun-filled day of music, games, activities, and pumpkin selecting. There will be live indoor entertainment, crafts, and games for children of all ages. There will also be a train to ride into the pumpkin patch for them to pick out their pumpkins. October 5 - 8: Mt. Thompson Homecoming Festival. The festivities include a souse-out on Friday, a cookout on Saturday and Monday and lots of other family-fun activities. October 5 - 9: Discovery Day Homecoming Festival. This festival encourages San Salvadorians worldwide to come home and celebrate Discovery Day, which commemorates the first landfall of the great navigator Christopher Columbus. October 5: Skippers' Welcome Reception at the Boathouse Restaurant. Enjoy signature cocktails and delicious appetizers along with live music. October 6: Dance the Night Away. Celebrate the weekend and enjoy some live music from 5:30 - 7:30 PM. October 6: Levy Preserve Moonlight Tour. Join for an evening of exploration on a guided night walk through the preserve with entomologists. October 6: Abaco Open Water Swim Race. Professional and non-professional swimmers of all ages are invited to compete in this event. There will also be a post race celebration that will include great music, food, drinks, and awards. 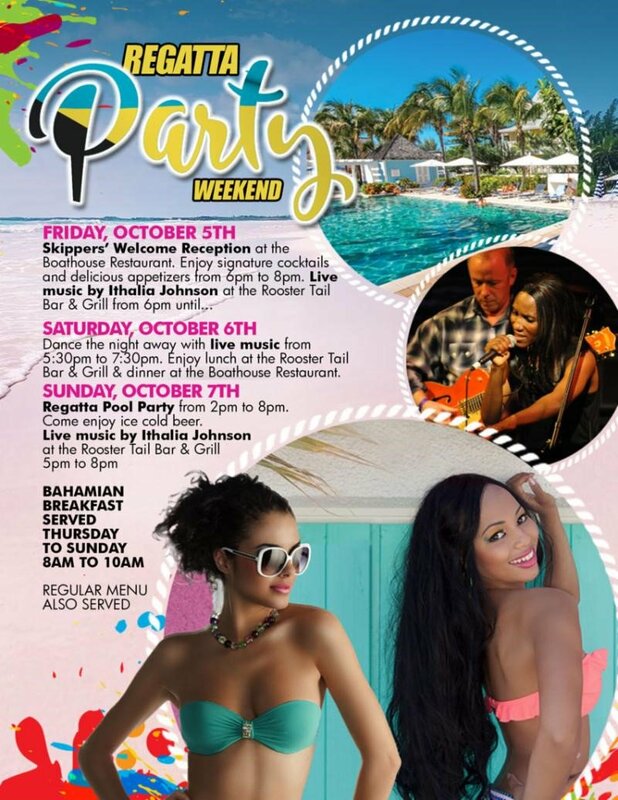 October 7: Regatta Pool Party. There will be ice cold beer, and live music at the Rooster Tail Bar & Grill. October 8: Mcleans Town Conch Cracking Festival. This Festival features lots of conch-themed dishes, other food and drinks, locally made souvenirs, as well as a full day of activities that both adults and children can participate in, competitions and exciting live entertainment. October 12: Inagua Conch Fest. This Festival will feature live band entertainment, a variety of conch related games (conch cracking, conch skinning, conch salad competition) for the entire family. October 14, 21 & 28: Jazz by the Sea. Music is provided by a variety of local artists. October 16, 23 & 30: The Coral Harbour Native Show. This event provides a Native experience for visitors traveling to Nassau & Paradise Island. It features live performances by local Bahamian artists, including Fire Dancing, Limbo Dancing, and Rake 'N Scrape music. October 26: Changing of the Guard. A tradition since 1958, the Changing of the Guard ceremony features the world-renowned Royal Bahamas Police Force Marching Band and Royal Bahamas Defense Force Guards. October 31: Halloween Bash in the Berry Islands. Enjoy a variety of prizes and surprises, while having a hallow fun of a time. October 9 - 18: The Moorings 37th Annual Interline Regatta. The Interline Regatta has kicked-off the sailing season in the BVI's for the past 37 years with exciting races, thrilling parties, and endless fun on the water. This event has now grown into an international celebration which attracts boaters and spectators of all types & skill levels. October 14: HIHO Sup Cup. Enjoy a fun SUP race featuring beginner & advanced course racing, and relay racing. There will also be a kids division and lots of fun prizes. October 20: Willy T Virgin's Cup. The Virgin's Race is one of the longest running in the BVI's Yacht Club Calendar. October 25: TICO Hallowines & Spirits Tasting. October 27: Foxy's Cat Fight Regatta. The Caribbean's fastest growing Multi Hull Regatta. October 12 - 14: The Corona Pro Surf Circuit. The iconic reef at Middles beach holds a historic place in surfing history. Enjoy intense competition this month when the top surfers from the Caribbean gather to compete. October 15 - 21: The International Billfish Tournament. Fish the best moon of October with plenty of blues, whites, and sails. The IBT provides four fishing days on some of the best battle wagons in the Caribbean with parties all week.